Customize your Clarin folding chairs to create the perfect solution for your facility. Clarin by Hussey Seating offers a wide selection of accessories to personalize and customize the seating in your facility. Your exclusive Hussey Seating dealer will work with you to create the right product solution to fit your facility, your needs, your vision AND your budget. Clarin's standard back design with a stylish "tuck". the retro Clarin back design that started it all. The plush contour seat cushion comes standard on all Premium Series models. A 3” (76 mm) thick padded seat provides exceptional guest comfort. This 2000 Series padded seat offers the most comfortable seating experience in the series, with your choice of vinyl or fabric upholstery. 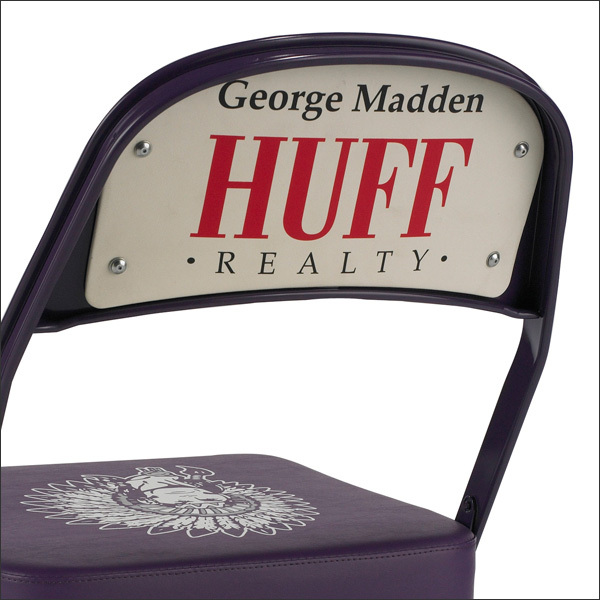 The perfect location for sponsor advertising, logos and any other message, the vinyl panel is mounted to the back of the chair. Emboss chair backs with the facility or department name for easy identification. Our in-house digital printing press with UV-cured inks produces crisp, long-lasting logo(s). A rich, sophisticated logo style. Add style, comfort and personal space with our waterfall poly arms. Add style, comfort and personal space with our waterfall upholstered arms. Add convenience, comfort and personal space with our cup holder poly arms. For two arm chairs, you can mix and match arm styles - one cup holder arm and one standard or waterfall arm. Add comfort and personal space with our standard upholstered arms. Add comfort with our standard style detachable arms. Add comfort and convenience with our waterfall detachable arms. Available in poly or upholstered. Add comfort and convenience with our cup holder detachable arms. Available in poly or upholstered. Great for classrooms, gymnasiums music rooms and training rooms, the standard tablet arm comes in your choice of wood laminate with black or clear stained edges. Add style with shiny chrome tablet arm support tubing. 1/8" ganging brackets welded to the frame for connecting armless chairs. 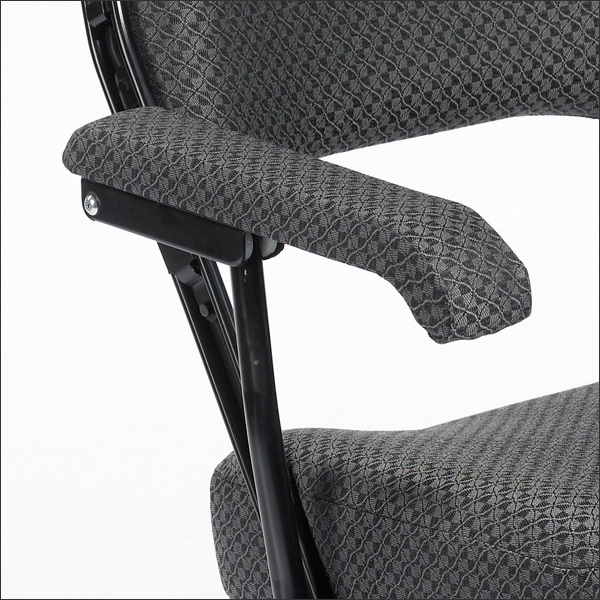 Add personal space to armless chairs with 1/2" ganging brackets welded to the frame. 1" ganging brackets welded to the frame for connecting arm chairs. Convenient hook and loop ganging for connecting two-arm chairs. Ganging that allows for curved rows. Allows ganging of folding chairs that weren’t initially ordered with ganging brackets welded to the frame. A variety of widths are available to customize personal space. Pre-coated chair frame, stainless steel washers, marine-grade vinyl, weather resistant threads, plastic seat and back boards for humid or covered outdoor applications. 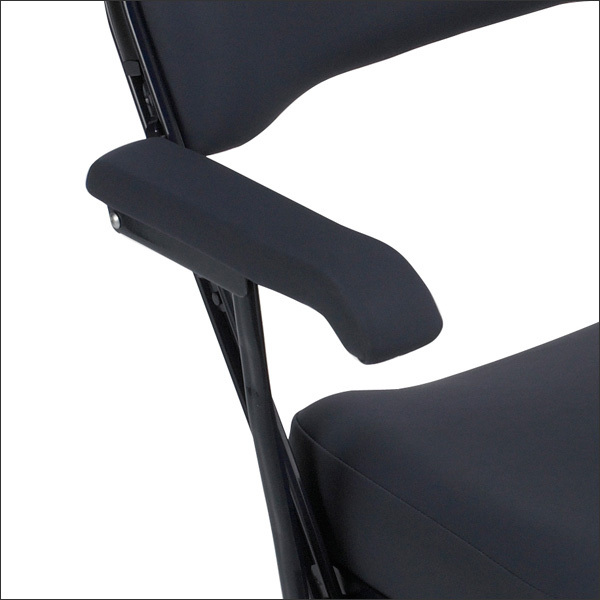 Add the finishing touch to your chair frames with wood grain poly or solid black poly frame trims. 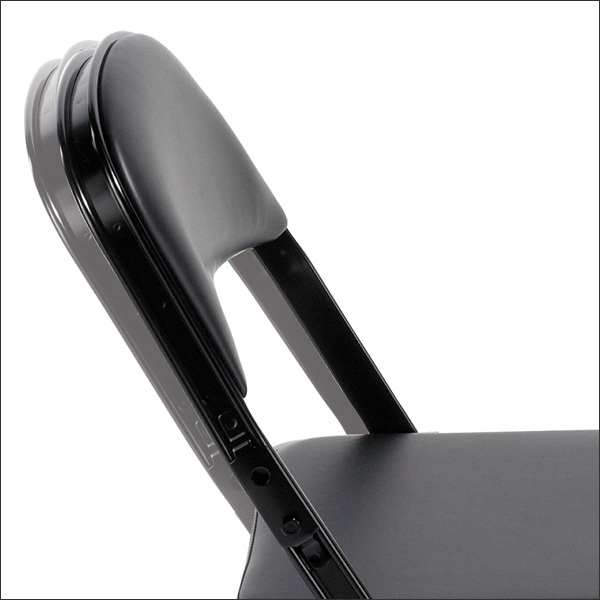 Provide extra strength and easy access to under seat storage. 25 degree seat back pitch instead of 30 degrees decreases front to back footprint to maximize seating capacity. Easily change out sponsors or logos with our vinyl slipcovers. 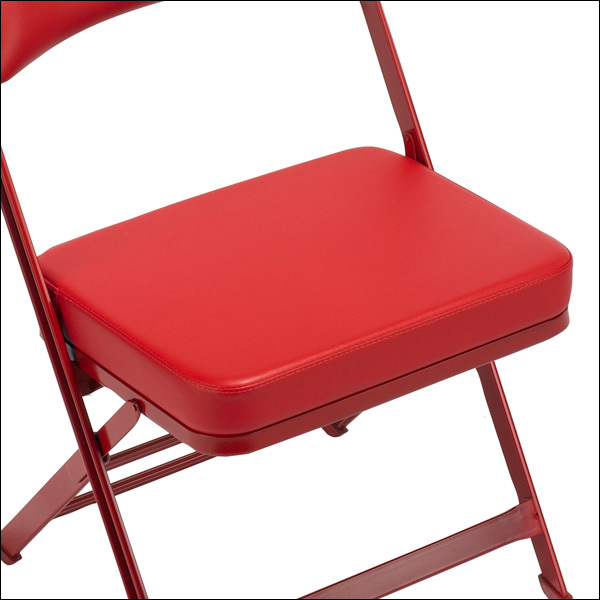 There’s a slip cover that fits every folding chair model.